The study of music involves much more than just learning how to navigate your instrument- which finger goes where, how to position your wrist, etc. The student of music also learns new ways of expressing mathematical concepts (rhythm), how to be an effective communicator (phrasing), and different languages, among other things. The study of rhythm primes your brain to think in sets and patterns and to break down complex information into smaller units. These are useful tools when it comes to general problem solving, but they are especially relevant in mathematics because of the fractions involved in counting and understanding rhythm. As a music student progresses, they learn what it means to “shape a phrase”, which could be likened to delivering an organized, effective speech, balanced with emotion and well-reasoned thought. These are things that aren’t necessarily emphasized in today’s culture, and especially for younger students. Understanding the musical concept of shaping a phrase and consistently putting it into practice opens up a whole new world of effective communication. Because the invention of the musical staff has Italian roots, the music student is exposed to a wide vocabulary of Italian words. Things like volume and tempo are indicated with Italian words like piano, forte, allegro, and lento. But music, in and of itself, has its own vocabulary and syntax. We learn the symbols for quarter note and half note, and we learn to associate them with particular tones on our instrument, and this process is similar to learning our native tongue. When the music student knows how to read notes on the staff, they are effectively speaking another language. 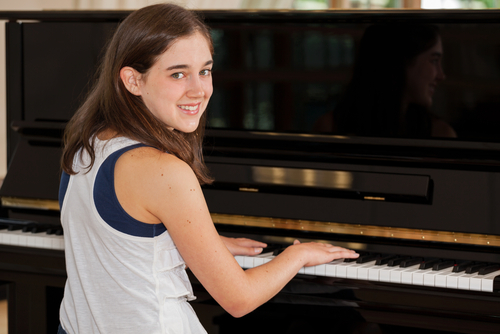 From a purely physical standpoint, the music student gains much from developing and training fine motor skills- but did you know that by just practicing your instrument, you are exercising your brain, too? Your brain doesn’t give equal attention to all parts of the body. The vast majority of your brain’s focus is towards two main areas; the hands and the mouth. So, whether you play the piano, the cello, or the kazoo, you are using a large portion of your brain in your daily practice session. These are just a few of the benefits of musical education. If you’d like to further develop your fine motor skills, or learn a new language, or become a better communicator, why not study music? For information about music lessons at the Altadena Academy of Music, please call (626) 296-0799 or use our email contact form. This entry was posted in Benefits of Music Lessons, Music Appreciation and tagged Benefits of Music Lessons by altamusicschool. Bookmark the permalink.